Mrs. Vidya MN has completed her Masters of Law [LL.M] in 2004 specialized in Constitutional Law and Bachelor of Law [LL.B] in 2002 from University Law College, Bengaluru. She also pursued PG diplomas in Human Rights & IPR from NLSIU, Bengaluru and PG Diploma Cyber law from NALSAR, Hyderabad. Further, adding to her credit she has M.B.A [specialized in HR] from Annamalai University and M.A in History from Kuvempu University. 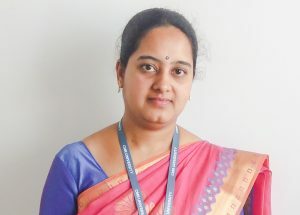 Presently she is pursuing her Ph.D at Alliance University, Bengaluru. In her 14 years teaching experience she has presented and published several papers on Prisoner’s Rights, Rights of Disabled People, Recidivism, Indigenous People and Climate Change, Women Property Rights, Cyber crimes, E-banking etc. She has also been a part of various National and State seminars, conferences, and workshops. Her subjects of interest are Constitutional Law, Human Rights, Company Law, Intellectual Property Rights and Cyber law. As a faculty coordinator of Guest Lecture Club, on behalf of our esteemed institution she has organized more than 20 guest lectures from past 2 years.